This is not your typical floor liner! Existing floor liners in the market today are constructed of extruded plastic materials vacuum formed to fit the vehicle. Rugged Ridge has taken a completely different approach to floor protection. 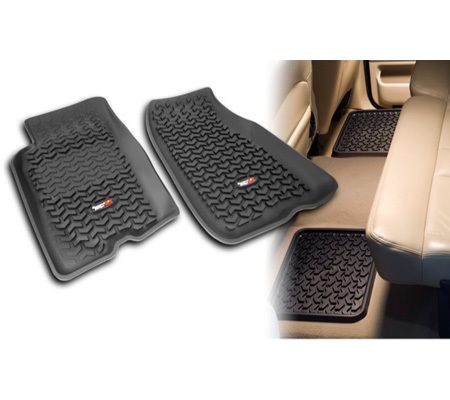 Each All Terrain Floor Liner is injection molded for superior fit and quality. The injection molded process, though more expensive to develop, allows us to create a floor liner that has exacting measurements or better fit and finish along with a deeply formed perimeter wall for maximum coverage. Each All Terrain Floor Liner has chevrons that are up to 3/8Ä deep. That is up to 3 times the depth of other floor liners! The chevrons keep water from sloshing and help divert mud water and snow away from the driver's pant leg. We call this true Deep Tread Technology!